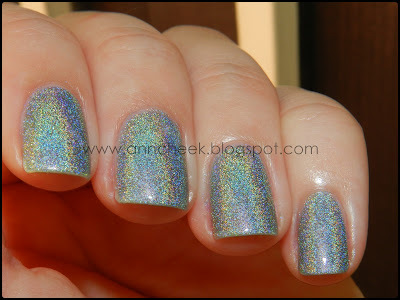 When I heard a news, that new Depend Holographic polishes are available in our stores, I have to go to see them and of course I couldn't go with no polish home. So I pick up Pacific blue. Its sad that the polishes don't have names written on bottles but only on stash. This one is in number 2034. Depend polishes coast 3,45€ for 5ml bottle. And in my opinion that's a little expensive, for a polish that need 3 coats for full coverage. But the effect on sun is gorgeous. And in shadow polish look a little bit boring. I will definitely buy some more polishes, because its the only drugstore holographic polishes that are available in our country. Whats you opinion on this polish?